In June this year, Joseph C Dias, put up a Facebook page called JoDi’s Art, to lure his 18 and 16-and-a-half-year-old sons to discover his childhood on a social networking site. “It has been to difficult to tell them about my birth place,” recalls Dias who has been based in Dubai for the last 25 years. Capturing his village, Utorda and its characteristic features that define a pre-modern Goa, Dias started illustrating various ways of life that precede the oncoming of electricity. In his quest to inform the younger generation as well as the average tourist, JoDi’s Art (Jo is for Joseph and Di for Dias) was conceived. “I felt that as kids today are drawn towards visuals, the infographics will be attractive for them,” shares the 48-year-old artist. GRANDMA’S KITCHEN: 1976 memories! This is how the artist remembers his granny’s kitchen. The moddki or large pot for heating bath-water required 21 bindulam (earthen pots used to draw water from the well) to fill it up. Granny undertook this task daily at 5.45 am before leaving home at 6 o’clock for Mass. Incidentally, the well had a depth of 21 ‘hands’ or haath (a local measure of depth). Granny managed this task even at 83! BULLOCK CART TOURISM: Once the main mode of transport in Goa of the yesteryears, bullock carts today draw the eyes of the tourists. On rare occasions, bridal couples have used them as their vehicles to reach religious services on time! THE GOAN LARDER: Imagine life without a fridge! But for generations everyone managed quite well without one. If needed, the nearby Crunet factory sold it. CAMINHAO: The caminhao was the old, Goan form of public transport. Till the early 1970s, these antiquated vehicles plied on the main roads of Goa, including the Margao-Tembim (Raia) route in Salcete and the Mapusa- Colvale route in Bardez. ALVORADA: On the feast day, the people woke up to the alvorada played by a traditional brass band. Efforts are now underway to revive ‘brass’ skills in Goa. 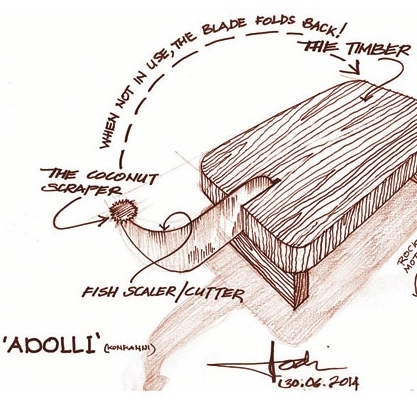 ADOLLI: Dedicated to Goan youngsters abroad who have never seen such a contraption. This kitchen gadget played a crucial role in preparing the trademark Goan fish-curry-rice meal. You grated the coconut here, and cleaned the fish scales too. BAKING FISH, GOAN-STYLE: If the river runs close to your home, as it does in the case of quite a few Goan villages, then you can start fishing in the morning and by noon cook some fish in the way depicted above. THE ADDAMBO: If you grew up in the Goa of yesteryears, this main-door to the home would have been a very familiar sight. Our Dubai-based artist, an architect by profession, appreciates the simple but secure anti-burglary measures and other house-building practices of the past. DANTEM: This sketch of a small stone-based flour mill helped the artist to explain to his two sons how his grandmother would make rice flour at home. They couldn’t believe it! These postcards have been published by Goa, 1556 that was started by independent journalist Frederick Noronha in 2007. To amble in the sepia-tinted mud lanes of the scenic state, pick a card in Goa, Mumbai and Dubai as well as online.